Baked cinnamon and sugar apple chips are an easy snack made with your favorite variety of apple. Cinnamon and sugar give the chips a sweet dessert flavor! Dried apples make the perfect sweet snack recipe. We always used to buy packages at the store, but making them at home is just as easy! You don’t even need fancy equipment. Just fresh fruit and an oven! Are apple chips good for you? 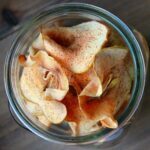 Homemade apple chips can definitely be a healthy snack option! Since they are made with fresh fruit, they are a perfect for grab-and-go healthy treats. This recipe does call for a little sugar. 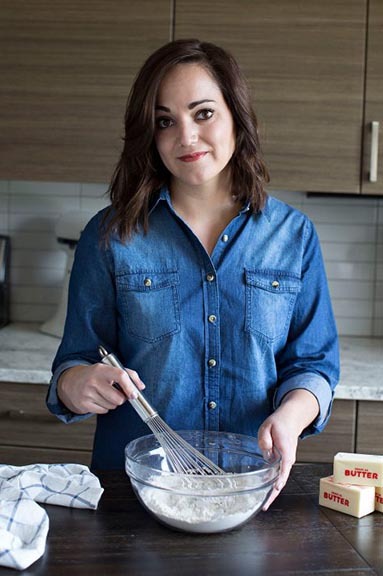 You can leave that off and use the same baking concept for a sugar free version! What apples are best for homemade apple chips? There are so many apple varieties out there, so where do you begin when picking the best for apple chips? Really, any variety will give you a great snack. It will depend on the flavor profile you want. We like to use gala, fuji, and honeycrisp. Gala apples give you a very sweet chip. We like this one best. The bold apple flavor shines through and there is less of a tartness. Fuji are available year round, which makes them convenient. Honeycrisp apples are our favorite all-around variety. Drying them enhances the flavor we already love and makes our favorite apple chip! How do you dehydrate apples in the oven? No need to buy fancy kitchen gear for apple chips! All you need is a sharp knife, your favorite apple variety, and your oven! Slice your apples thin. It is best to do this with a mandoline slicer, but a sharp knife will work as well. Be sure to watch your fingers! Lay your apple slices out on a parchment lined baking sheet. Bake for one hour at a low temperature. Flip, turn the oven down, and bake for an additional hour. The secret to a crisp chip with a soft and chewy center is to allow the apples to cool completely in the oven. When the final baking hour is complete simply turn the oven off. Let them sit for 4-8 hours or until completely cool. From there, transfer to a zip top bag or air tight container. Preheat your oven to 220 degrees. Line two cookie sheets with parchment paper and set aside. Slice your apples using a sharp knife or mandolin slicer. You want them fairly thin. Place in a single layer on your two prepared baking sheets. Combine the cinnamon and sugar and sprinkle over your apples. Bake for one hour. Remove from the oven and flip. Turn the heat down to 170 degrees and put them back in for another hour. Turn your oven off and let them sit in there for 2-4 hours, or overnight. Love this recipe. I didn’t lower the temp after turning over the apples. They turned out amazing.